Pest Monitoring Moths can be sampled with pheromones placed in inverted cone-type traps. A first application of insecticide is made at first silk regardless of moth counts. 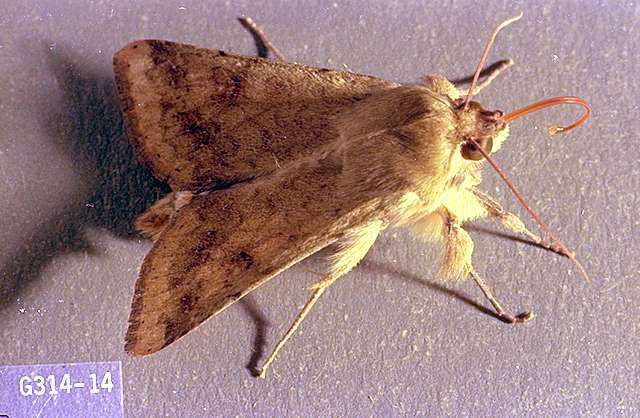 The presence of five to ten moths per night per trap may be considered a tentative action threshold for additional sprays. Fresh-market corn has very little tolerance of earworms. Sweet corn for processing rarely is sprayed unless outbreaks are early and intense (20 to 30 moths per trap per day) at first silk. 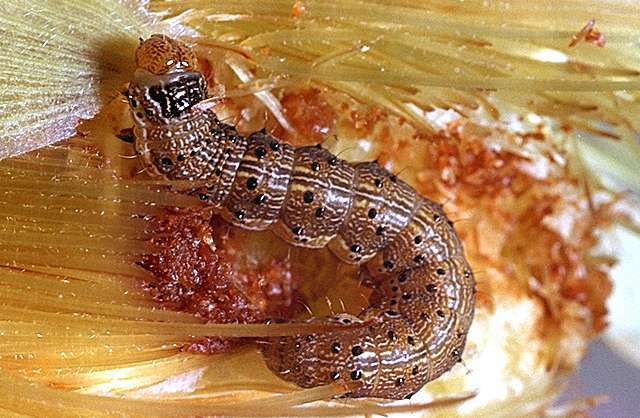 Earworm becomes a problem in processing sweet corn when the larvae penetrate deeply into the ear. A single application at first silk during intense moth egg laying events may be justified for processing sweet corn. Once larvae enter the corn ears, control with insecticides is very difficult. It depends on proper timing and thorough coverage. Begin sampling at first visible silk. The presence of large numbers of eggs on fresh corn silks indicates the potential for damaging populations. Begin treatments during silking stage, at the start of egg hatch. Direct insecticidal control towards young larvae that are feeding on the exposed ear tips. 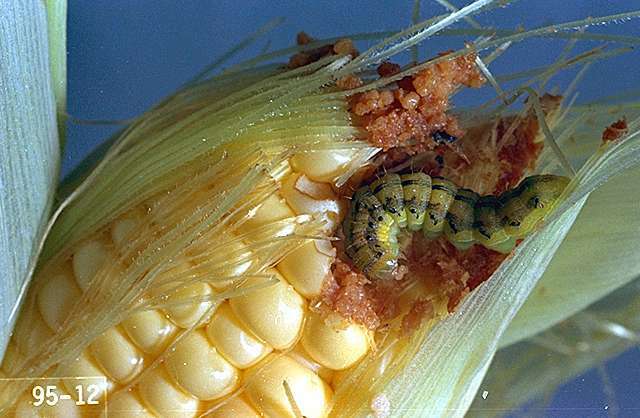 In sweet corn, very early plantings often escape significant damage compared with late-season corn, because earworm population densities increase as the season progresses. Some varieties of corn seem to suffer more corn earworm damage than others. These include varieties with tight husks like 'Country Gentleman,' 'Golden Security,' 'Silvergent,' and 'Staygold.' A clothespin placed at the point where the silk enters the ear can prevent earworm access. Plow or dig up plants in the fall to prevent overwintering. Apply when silks first appear. Repeat three to four times as label allows. Direct insecticide application to silk. carbaryl (Sevin 4F) at 1 to 2 lb ai/a. PHI 2 days for harvest of ears, 14 days for forage, 48 days for fodder. REI 24 hr. Retreatment interval 3 days. Limit 8 treatments per year Do not exceed 16 lb ai/a per crop. chlorpyrifos (Lorsban 4E) at 0.75 to 1 lb ai/a. PHI 21 days. REI 24 hr. Postemergence broadcast or sprinkler application. Limit 3 treatments of any chlorpyrifos product. Retreatment interval 10 days. Do not exceed 3 lb ai/a per season. Consult label for application details. cyfluthrin (Tombstone) at 0.025 to 0.044 lb ai/a. PHI 0 days. REI 12 hr. Retreatment interval 2 days. Do not exceed 0.44 lb ai/a per season. deltamethrin (Delta Gold) at 0.018 to 0.028 lb ai/a. PHI 1 day. REI 12 hr. Do not apply more than 0.45 lb ai/a in one growing season. esfenvalerate (Asana XL) at 0.03 to 0.05 lb ai/a. PHI 21 days. REI 12 hr. Do not exceed 0.5 lb ai/a per year. gamma-cyhalothrin (Declare) at 0.0075 to 0.01 lb/a. PHI 1 day. REI 24 hr. Do not graze. Do not exceed 0.24 lb ai/a per season. indoxacarb (Avaunt) at 0.045 to 0.065 lb ai/a for application through tassle push only. PHI 3 days; 35 days for fodder & stover. REI 12 hr. Limit 4 treatments per season. Do not exceed 0.26 lb ai/a per crop. methomyl (Lannate SP) at 0.3 to 0.45 lb ai/a. PHI 0 days for ears, 3 days for forage, and 21 days for stover. REI 48 hr. Do not exceed 6.3 lb ai/a per season. mineral oil-Apply direct to silk. OMRI-listed for organic use. permethrin (Ambush 25WP, Pounce 25WP) at 0.1 to 0.2 lb ai/a. PHI 1 day. REI 12 hr. Retreatment interval 5 days. Do not exceed 1.2 lb ai/a for Ambush and 0.8 lb ai/a for Pounce per season. polyhedral occlusion bodies (Gemstar LC) at 4 to 10 fl oz formulated product per acre. PHI 0 days. REI 4 hr. Retreatment interval 2 days. OMRI-listed for organic production. spinetoram (Radiant SC) at 0.023 to 0.047 lb ai/a. PHI 1 day for ears, 3 days for forage. REI 4 hr. Retreatment interval 2 days at silking. Do not exceed six applications or 0.281 lb ai/a per season. Follow resistance management procedures on the label. zeta-cypermethrin (Mustang) at 0.028 to 0.05 lb ai/a. PHI 3 days for grain, stover & forage. REI 12 hr. Do not exceed 0.3 lb ai/a per season. Retreatment interval 3 to 5 days.